AFP is Hiring CMO Professionals | IT, Writer, Graphic Artist, Animator, Mechanic, Electrician, & More - Exam News, Reviewer, Military Career, & Everything [MN] . . The Civil-Military Operations Regiment of the Armed Forces the Philippines is inviting qualified applicants to join their unit. The Civil-Military Operations Regiment is a specialized unit of the Philippine Army that conducts focused and purposive Civil-Military Operations to support the different Philippine Army units in order to gain the support of the Filipino people. 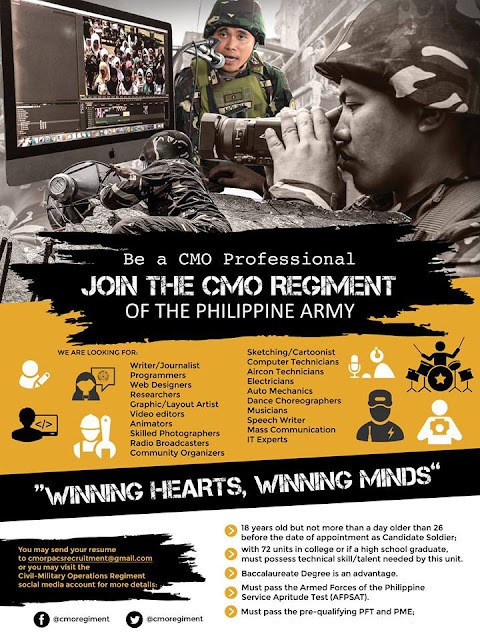 The unit’s byline is Winning Hearts, Winning Minds which is the soul of the Philippine Army mission of Serving the People and Securing the Land.